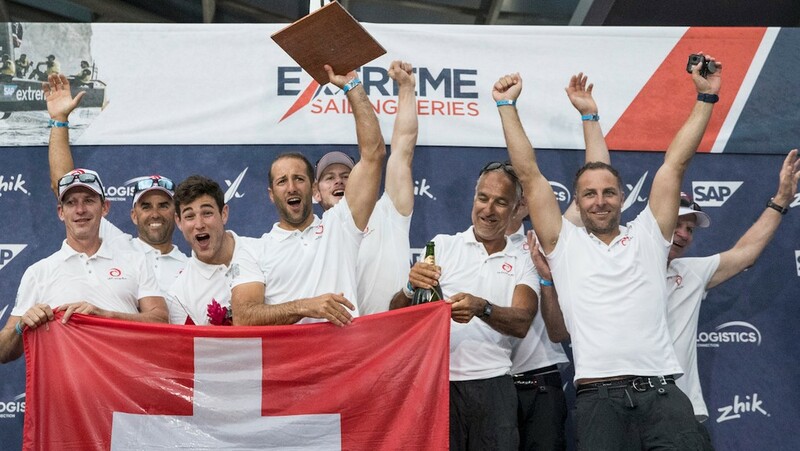 Swiss team Alinghi took the 2018 Extreme Sailing Series championship title after a remarkable final in Los Cabos, Mexico. This was a fourth title win for Alinghi which makes them the joint most successful team ever to participate in the world-class, globe-trotting foiling circuit, level with former competitor, The Wave, Muscat. Alinghi comprise of Arnaud Psarofaghis, Nicolas Charbonnier, Timothé Lapauw, Bryan Mettraux, and Yves Detrey. They finished top of the Los Cabos leaderboard, 11 points ahead of Roman Hagara’ s Red Bull Sailing Team, with Oman Air of Phil Robertson in third pllace. In the overall standings Alinghi finished nine points ahead of Oman Air, with SAP Extreme Sailing Team of Rasmus Køstner in third place. The British team of Ben Ainslie finished fifth in both events.